In 2012 I will be taking up a SAR Fellowship, SAR being the acronym for Scholars and Artists in Residence, for two months at the National Film and Sound Archive. This Fellowship will enable me to investigate a lesser known aspect of the career of designer Kristian Fredrikson, namely his commissions for film and television. In addition to designing costumes for one or two televised ballets in the late 1960s, in the 1980s Fredrikson worked on at least three feature films, Undercover, Sky Pirates, and Short Changed, and three mini-series for television, The Shiralee, The Dirtwater Dynasty and Vietnam. I’m looking forward to delving into this aspect of Fredrikson’s multi-faceted career. The SAR program aims to promote the NFSA as a centre for scholarly activity, to encourage and facilitate research relating to the NFSA collections and programs and to bring new ideas and expertise to the NFSA. In addition to my meeting with Stanton Welch while in Houston recently, which was the subject of a recent post, I spent half a day with Laura Lynch, Houston Ballet’s wardrobe manager. Laura spoke to me at length about Kristian Fredrikson’s designs for ‘Pecos’, part of a Houston Ballet evening length program called Tales of Texas, and Fredrikson’s last work, a new version of Swan Lake. Both works had choreography by Stanton Welch and his Swan Lake, which premiered after Fredrikson’s death, was dedicated to Fredrikson. We also visited the HB warehouse, a little out of town, to have a look at the costumes themselves. 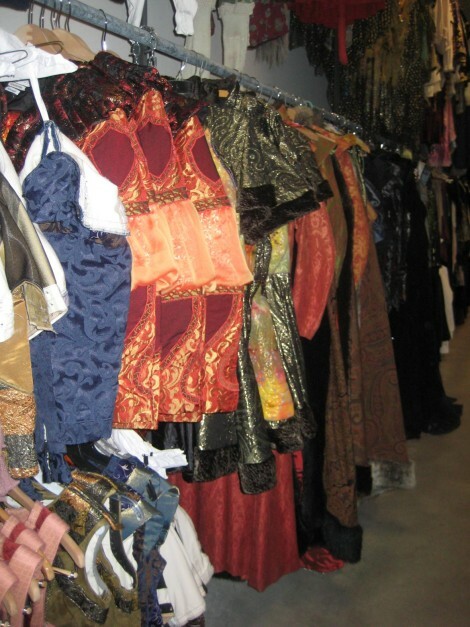 Rack of costumes for the Houston Ballet production of Swan Lake. Most readers of this site will remember Miranda Coney, a much-loved principal of the Australian Ballet during the 1990s. Miranda is now living in New York with her husband, conductor Charles Barker, and their two young sons. I caught up with her while in New York and was more than delighted to know that she has been giving class to young dancers in the current Broadway production of Billy Elliot—‘quite a challenge’ she says! In November the Canberra Critics’ Circle met to discuss nominations for its annual awards, which were presented on 29 November. Two dance awards were made. Liz Lea received an award for her creative use of archival material from Canberra collecting institutions in her solo production of 120 Birds. Lea showed 120 Birds as a work for a small company at the Edinburgh Fringe in 2010 but reworked it as a solo show for presentation in February 2011 as an event associated with the National Gallery of Australia’s Ballets Russes exhibition. She drew on material from the National Film and Sound Archive, the National Library of Australia and the National Gallery of Australia bringing it all together to pay homage to those intrepid artists who toured to and from Australia when communications were not the instant experience we know today. Photos from Lea’s Gallery performance are at this link. Elizabeth Cameron Dalman received an award for her poignant and moving show Sapling to Silver, which was the story of a vibrant life—her own life in dance. I recall in particular from that show a duet between Dalman and Albert David in which two cultural heritages were juxtaposed, as were two lives lived in different generations. The citation for Dalman’s award also mentioned the seamless way in which the various sections of the work were put together to deliver a beautifully produced whole. The link to my tribute to Valrene Tweedie, an article originally published in Brolga. An Australian journal about dance in December 2008 and posted on this site in July 2009, is not currently available as it was previously via the Ausdance website. The National Library of Australia’s web archiving service, Pandora, came to the rescue however and the tribute is now available at this link. I got to this site when I was ‘surfing’ The Australian Ballet Company Artists. I noted your future work about Kristian Fredrickson and it brought to mind the time I worked as his assistant on the play, Oedipus Rex for the Emerald Hill Theatre Company in the mid-sixties. I see your research will be on his film and television history, and I don’t have that much to contribute, but I do remember him, his generosity and spending a few weeks making stage masks and props with him. If you want to get in touch, please do. Good luck with your Fellowship.